Route 128/Interstate 93 near Exit 4. On some parts of the highway, but not all, a left lane has been added. That was in 1985, when the Globe reported that the Federal Highway Administration was about to give the state special permission to allow rush-hour drivers to use the breakdown lane on parts of Route 128 lacking four lanes in each direction. At the time, state officials called it a temporary measure to expand capacity, needed only until they could construct a true additional lane in each direc­tion, a project they said could cost $50 million and be finished in five years. Of course, those were the same people who brought you the Big Dig. The actual cost is more like $350 million, about 3½ times the inflation-adjusted sum, and the first shovel did not go into the ground until 2003. The work might wrap up by 2017. 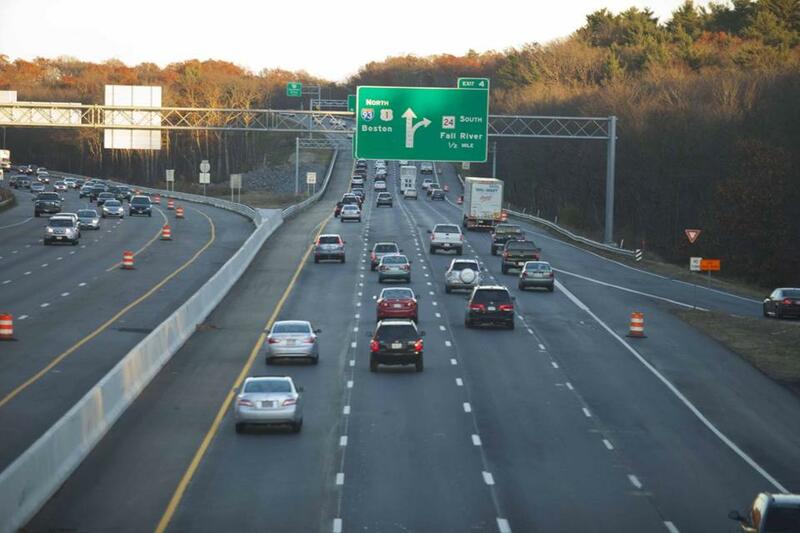 An announcement by the state last month about new travel lanes may have given a different impression, suggesting that the Route 128 Add-a-Lane project was nearly done. Not the case, as drivers endur­ing continued construction can attest. Instead, one phase of the project is nearly done. “Don’t tell me the work is nearing completion!” said ­Gerald Clarke, a consultant and retired professor at the Boston University School of Management. Some of the confusion stems from the fact that the state has treated the Add-a-Lane project like six projects, each with its own contract and listing on the Highway Division website. Considered together, the six phases amount to adding a new lane in each direction along nearly 15 miles of highway — from the Route 24 interchange in Randolph to the Route 9 inter­change on the Wellesley-Needham line — and rebuilding nearly two-dozen decades-old overpasses that either carry Route 128 or carry local roads over the highway. The first three phases handled half the bridges but less than 2 miles of highway widening, at a total cost of $86 million, said Michael Verseckes, spokesman for the Department of Transportation. The fourth phase widened 5½ miles of highway from ­Randolph to Westwood, ending at Route 109. That $54 million job, begun in 2008 by McCourt Construction, was complete enough last month that its new lanes were opened and its breakdown lanes closed to traffic. But more work is needed in the spring, when the weather will be warm enough for a final round of paving. Though that phase widened the highway north to Route 109 (Exits 16A/B). it did not ­include two bridges carrying Route 109 over Route 128 north and south at the Dedham-­Westwood line. That work is part of a fifth phase ($77 million), also won by ­McCourt, started last year and expected to last until 2015. Confused? Try driving along the constricted Route 109, part of which was demolished earlier this year, but where work has mysteriously stopped. “The project appears totally abandoned,” Clarke wrote. Turns out contractors did not find bedrock where they ­expected to along the southbound side of 128. That has complicated the Route 109 bridge reconstruction and may require deeper excavation and construction of special footings to support the overpass, said Verseckes. So contractors shifted to another area, while the state determines how to handle this and how much more it will cost. Though breaking the Add-a-Lane project into phases has prolonged the overall work, it has allowed the state to direct scarce dollars to other projects at the same time, Verseckes said. The federal government is reimbursing 80 percent of the total. Because the state is ending breakdown lane usage with the addition of a fourth full-time travel lane, the project is less about adding capacity than about handling capacity more safely, preserving the breakdown lane for breakdowns and providing space for emergency vehicles to bypass congestion. The need was underscored by a 2002 fatality: A New York driver on a business trip died of head trauma after he pulled over in Needham, apparently to read a map, and his Saturn was smashed by a Ford Econoline van barreling down the breakdown lane. Michael Wyatt, who commutes from Duxbury to Needham, said he appreciates the project’s goals, if not the daily reality. When 5½ northbound miles of additional lane opened after Thanksgiving, his usual 60-minute morning commute grew half an hour, as a pinch point shifted and drivers adjusted to the new conditions. It has improved only somewhat in subsequent weeks. Jonathan R. Davis’s tenure as acting general manager of the MBTA is scheduled to end Monday with Beverly A. Scott’s arrival from Atlanta to take the helm. The mild-mannered ­Davis, who will return to his behind-the-scenes role as the T’s chief financial officer, has been much more than an interim seat-warmer. Davis was tapped in August 2011 when Governor Deval Patrick promoted Richard A. Davey, the previous general manager, to transportation secretary; he officially started Sept. 2, 2011. Davis’s 16½ months running the T have been unusually eventful, most notably in facing packed, emotionally charged gatherings while attending 27 of the 31 hearings held on fare increases and service cuts, missing only the ones that were double-booked. He has also overseen introduction of countdown signs at subway stations and mobile ticketing for commuter rail, increased fare-evasion enforcement, launched the T’s first campaign encouraging riders to be courteous toward employees, and led the 6,000-worker agency through a period of ­record ridership. He also said he was proud of inroads the T has made in educating the public about reasons for the agency’s fiscal crisis, with debate about to begin on transportation finance in the Legislature. Analysts and academics widely agree it is not the result of waste or mismanagement — the T stacks up competitively against peer agencies on cost per mile and per passenger — but reflects Beacon Hill decisions to saddle it with more debt than can be covered by existing fares or the T’s share of the state sales tax. Davis said he initially expected to occupy the position for four to six months, and he sounded surprised when I mentioned his tenure was just a month less than Davey’s as general manager. Indeed, Davis is the longest-serving interim general manager in the modern history of public transit in Boston, since the state purchased the Boston Elevated Railway in 1947 and replaced it with the MTA, the MBTA’s predecessor, according to transit historian Bradley H. Clarke, president of the Boston Street Railway Association.